Ayrshire Chamber of Commerce held its AGM on Thursday 22 September at which it reported a highly successful year in which the Chamber continues to support its members and the broader interests of the economy of Ayrshire & Arran. The Chamber has been nominated as a finalist in the WestSound awards for the Best Place to Work category and has also been nominated as a finalist in the British Chambers “Chamber of the Year” Award 2011. Chief executive Martin Cheyne presented the Report of the Directors before introducing guest speaker Nora Senior - MD Scotland, Weber Shandwick and Vice President of Scottish Chamber of Commerce and British Chamber of Commerce. During the proceedings, the Chamber appointed Mr Willie Mackie as President, succeeding Mr Steve Brannagan. Mr Mackie has been Vice President for two years and is looking forward to his term of office. Mrs Wai-yin Hatton has been appointed Vice President. Mrs Hatton has been a Director for a number of years and is looking forward to supporting the President. The Chamber has a very strong Board which actively participates in the development of Ayrshire Chamber of Commerce & Industry. Willie Mackie, Managing Partner of Clydesdale Bank’s Ayr Financial Solutions Centre (FSC), said: “I have been involved with the Ayrshire Chamber of Commerce for many years now, and I am very proud to be taking over the important role of President of the Board of Directors. Through my role with Clydesdale Bank I have had the opportunity to work with many of the region’s best business people, so I know the region has plenty to offer as a business destination. Formalities over, the delegates enjoyed the opportunity to network and enjoy a buffet and refreshments sponsored by Gailes Hotel. 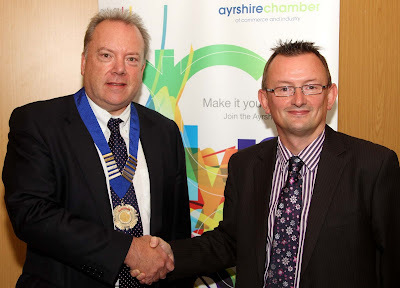 Ayrshire Chamber is a completely independent and not for profit organisation with one straightforward objective. It exists solely to promote and facilitate business between its members and others, therefore representing the best interests of the community by encouraging commercial growth and local prosperity.